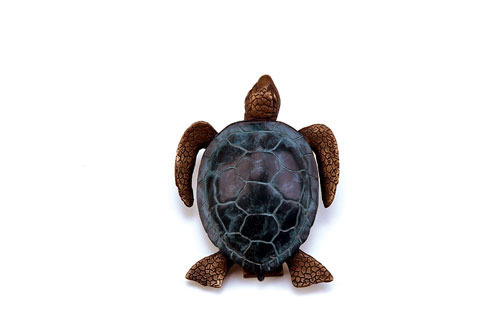 This beautiful Sea Turtle Door Knocker will bring a unique and artistic addition to your home or office. Cast using the "lost wax" process, this is the most precise metal casting technique in existence, ensuring accurate reproductions of the original sculpture and exquisite detail. "Lost wax" casting dates back thousands of years. While modern methods and materials have improved the technique, it is still an extremely labor intensive and expensive process. The beautiful artwork is created using only the best brass. Handcrafted with the finest details and materials, this piece of functional artwork will bring a lifetime of enjoyment. A wonderful gift for a friend or loved one as well! 6 inches Tall, 5 inches Wide, and 2.5 inches Diameter. Materials: Bronze.